On Monday, I had the occasion to meet and hear Swami Satyamitranand Giri Maharaj of Haridwar speak at the Brahmarishi Mission in Kitchener. Funny how you go around the world to meet people who live just next door. But then, I don't get out that much in Rishikesh. As usual, when listening to sadhus speak, I feel the great gulf of difference in the quality of speech of a native Hindi speaker and my own stumbling and bumbling mode of expression. I know I say this every time, but I had just spoken the day before--stumbling and bumbling. and the seed of the tree of religion. May it forever bring you all good fortune. Of course, he said Rama-nama instead of Krishna-nama. But that was no less a source of joy. 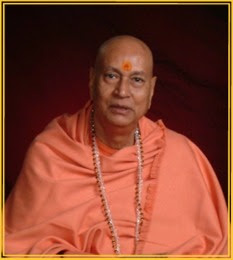 The subject of his talk was sat-sanga, which was the way that Didiji introduced him, thanking him for bestowing his saintly association on the devotees. He quote many other favorite verses from the Gita and Bhagavatam, though he was mostly citing Goswami Tulasidas. Nevertheless, on the whole he was very bhakti oriented. Devotees talk to each other about the sanctifying glories of the Lord. They find pleasure and satisfaction in each other’s association, teaching each other about how all their distresses can be brought to an end, remembering and reminding each other of Krishna who takes away all sins. From this devotional service in practice they develop a higher devotion which makes them ecstatic and the hairs on their bodies stand on end. In any case, it certainly brings great pleasure to the ears and heart when one hears Hari katha nicely done, and it certainly inspires me to try to do better myself in glorifying the Divine Couple.